Every now and again here at the Billy Casper Digital Network, we like to take a look at some of the most memorable holes from courses throughout our portfolio. 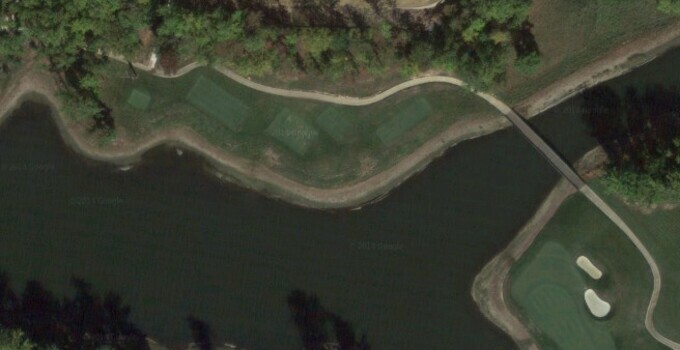 We call them Signature Holes, and we get a little help from Google Maps to share with you how some of our best holes layout and how to play them. Today, we look at a hole on one of the newest courses in the BCG portfolio, Lake Presidential Golf Club in Maryland. Lake Presidential opened in 2008, with the Jeff Potts designed stretched out to a max length of 7,200 yards. It's been a favorite for corporate events because of its proximity to D.C. However, the course has some outstanding holes that deserve some kudos. The par-3 ninth is arguably the most intimidating hole on the course. It's a par 3 whose tee shot is almost all carry over water. From the back tees, it can play some 220 yards. However, getting over the water is just one critical part of the battle for par. The green is the deepest on the course, meaning a two-putt can be tricky. But on top of its depth, the green has three tiers, making position extremely important. Do not hit past the pin. But don't hit it in the water either. And, oh yeah, you're just one hole away from a hot dog at the halfway house. Yeah, it's a tough shot.